Sasa vetchii can get to about 5 feet tall but mine usually averages about 2 to 3 feet tall. 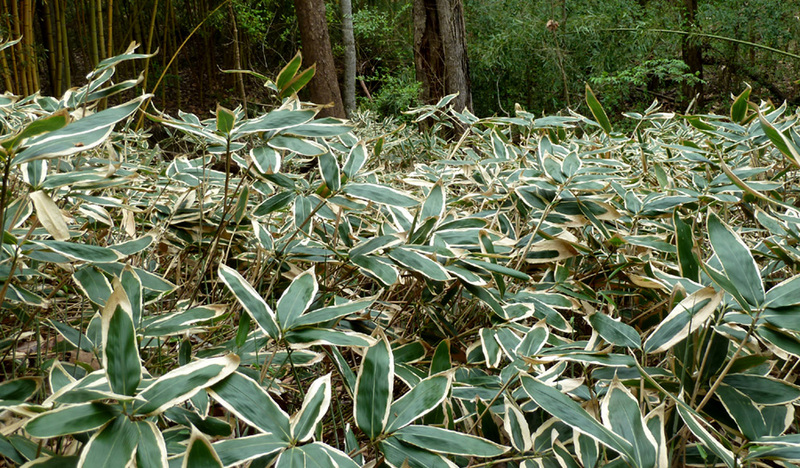 The bamboo grows very dense and is considered a “ground cover” bamboo. When new leaves emerge in the spring they are green. In the fall, in just a couple weeks time, the greens all turn white around the edges. This is when the bamboo is the prettiest. 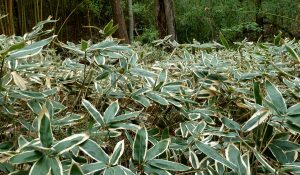 It makes an ideal specimen plant and is ideal for erosion control. My grove does well with just a little sun. It grows and spreads rapidly. Sasa-vetchii on the back of our dam. We planted Kuma-zasa on the back of our dam where water runs if the pond floods. It has resisted erosion several times. After a heavy flood the bamboo will be flattened but springs back up, usually looking good as new. Notice the white edges of the leaves.